About 200 high schoolers are among the first to experience a new program designed to introduce students to the inner workings of a pathology laboratory. Students learn what medical lab professionals do on a daily basis, and they explore the variety of professional careers available in the burgeoning healthcare industry. 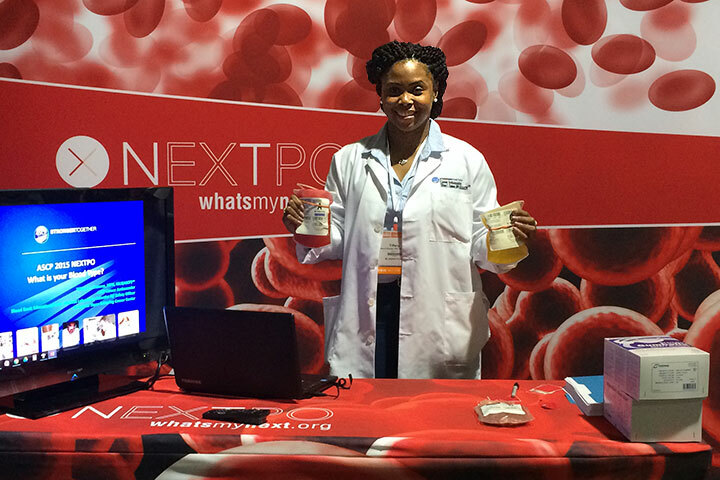 As part of the program “What’s My Next,” the American Society for Clinical Pathology partnered with local schools to bring students to its Oct. 28 to 30 annual meeting at the Long Beach Convention and Entertainment Center. Students took part in interactive experiments, discussions and presentations by lab professionals. Students also attended a session with annual meeting keynoter Barak Goodman, a documentarian who worked with Ken Burns to produce and direct the highly anticipated 2015 PBS documentary series, “Cancer: The Emperor of All Maladies.” Goodman shared with students his unique perspective on advancing the practice of medicine and the vital role pathologists and laboratory professionals play in the global fight against cancer. “By inviting the students to take part in interactive experiments, exposing them to successful medical laboratory professionals and pathologists, and offering them educational exercises to learn about amazing new scientific discoveries, we hope to expand their awareness of the exciting career opportunities that exist in laboratory medicine and pathology,” Holladay said. In advance of attending the annual meeting, students completed the Lab Hero Challenge, an e-learning module on whatsmynext.org that introduced them to the behind-the-scenes lab roles and related work completed to diagnose and inform the treatment path for a breast cancer patient. To offer the program, ASCP partnered with Switzerland-based Roche, a leader in research-focused healthcare, including pharmaceuticals and diagnostics. ASCP is a medical professional society with more than 100,000 members including board-certified anatomic and clinical pathologists, pathology residents and fellows, laboratory professionals and students. ASCP provides education, certification and advocacy on behalf of patients, pathologists and laboratory professionals. Participating high schools included Cabrillo, Jordan, Lakewood, McBride, Poly and the California Academy of Mathematics and Science. As part of the program, ASCP President Dr. William G. Finn presented CAMS student Brandon Choe with a Third Annual ASCP STEM Student Scholarship Award valued at $2,500. LAB SCIENCE – Tiffany Channer, a medical scientist and career ambassador with the American Society for Clinical Pathology, helps students to explore careers in the healthcare industry. She is one of several industry professionals working with local high school students.